The doctrine of administrative deference, commonly known as Chevron deference, has governed administrative law since 1984. Recent political changes now threaten its existence. The Republican Party, in control of all three branches of Federal government, has freedom to pursue its agenda of deregulation. Eliminating Chevron deference, however, may increase the difficulty of deregulation. In Chevron, U.S.A., Inc. v. Nat. Res. Def. Council, Inc., the Supreme Court established a two-part test for reviewing an agency’s interpretation of a statute. The reviewing court should examine whether Congress’ intent is “clear.” If Congress’ intent is clear, the court must rule to effect that intent. If Congress’ intent is unclear or the statute is silent about an issue, the court must determine whether the agency’s interpretation “is based on a permissible construction of the statute.” In cases of ambiguity, the court should defer to the agency’s interpretation, if the interpretation does not run afoul of the narrow categories listed in 5 U.S.C. § 706(2). On January 11, 2017, The House of Representatives passed H.R.5 – Regulatory Accountability Act of 2017. The bill would grant courts de novo review of questions of law and agency made rules when reviewing agency actions. Additionally, even if there is a gap or ambiguity in the statute, the proposed bill requires courts not to defer to the interpretations of agencies, eliminating Chevron deference. While the bill has passed in the House of Representatives, the Senate has previously rejected similar measures. Neil Gorsuch, the current Supreme Court nominee, has criticized Chevron Deference. In a Tenth Circuit concurrence, Gorsuch labeled Chevron deference “an elephant in the room.” His primary critique of Chevron is that it transfers judicial review and the ability to essentially legislate in cases of legislative ambiguity from the judiciary to the executive. Because an agency decision can affect “huge swaths of the national economy one day and reverse itself the next,” the limits of agency authority are ambiguous. If confirmed by the Senate, Gorsuch would change the previous status quo, as Antonin Scalia supported Chevron, with some limitations. If Chevron is eliminated, there will be significant effects on agencies’ ability to regulate. Agencies will be restricted: both by courts and through internal agency decisions. Regulation will likely decrease, or at least not increase, as regulatory guidance in areas left ambiguous by a statute will no longer be given precedence over judicial opinion. The decreased likelihood of agency action being upheld by a court may make litigation against agency actions more likely. In turn, agencies would likely take fewer actions in areas of ambiguity because these actions would be less likely to be upheld. While the end of Chevron deference will make regulation more difficult, it will also make deregulation more difficult. Just as agencies will be subject to stricter judicial review when interpreting ambiguous provisions to create new rules, agencies will also be subject to stricter judicial review when repealing rules. The increased difficulty of deregulation through administrative deference will delay changes to agency regulations. Removing administrative deference inhibits the executive from making prompt regulations in two ways. First, it increases the likelihood the judiciary will remand the decision to the agency to comply with the court’s ruling. Second, it increases the likelihood of inconsistent case law in lower courts. After Chevron was decided, there was a significant decrease in remands resulting from legal errors by agencies. Eliminating administrative deference would likely reverse this effect. Administrative deference promotes uniformity among the lower courts. Because agencies are free to regulate in areas of statutory ambiguity, courts are less likely to disagree with each other about statutory interpretation as they all look to the agencies for guidance. Eliminating administrative deference would result in a stricter meaning of statutes. Agencies would have to determine the single meaning of the statute – a “point estimate” as opposed to a “policy space.” Given that Chevron deference relates to areas of ambiguity or silence, lower courts are likely to come up with inconsistent point estimates. An agency seeking uniformity in a ruling across all circuits confronts difficulties including obtaining the necessary permission from the Solicitor General to seek a writ of certiorari, who may not be incentivized to grant permission frequently, and the need to establish enough of a conflict between circuits to merit Supreme Court review. 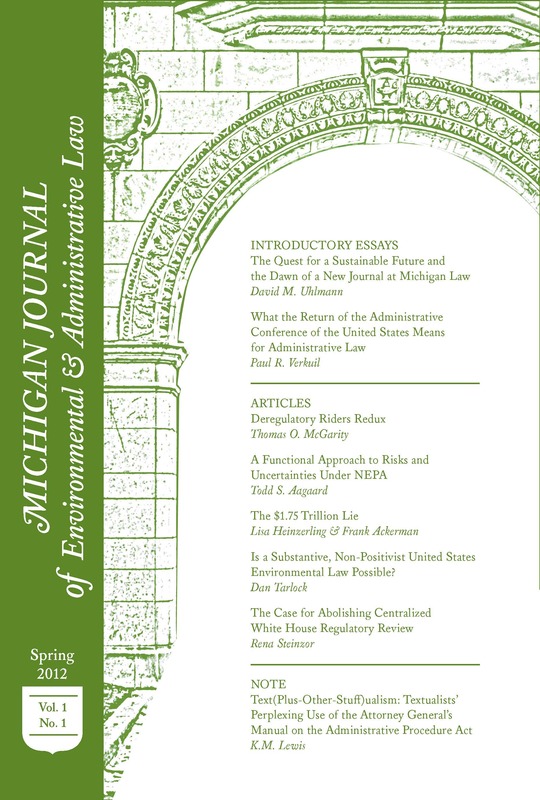 The nullification of administrative deference may not, however, alleviate courts’ reliance on agency policy-experts. The issues brought before courts in this realm are often highly technical because disagreements concern ambiguous provisions. Courts may choose to defer to the judgment of policy-experts when confronted with highly technical issues. Though a court may give deference to experts, in the absence of Chevron the court would be exercising its option, rather than its obligation. Depending on how often courts choose to exercise this option, the impact of the nullification of administrative deference on the ability of an agency to regulate or deregulate may be somewhat mitigated if courts continue to rely on agency experts. Another factor mitigating the importance of administrative deference is its scope – it applies in situations with ambiguous provisions or congressional silence. Some members of the Republican Party have been anything but silent in their desire to dismantle not only major agency regulations (e.g. Dodd-Frank) but also entire agencies (H.R.861 – To Terminate the Environmental Protection Agency). With such drastic proposals framing the debate, the limits of deregulations resulting from a nullification of Chevron deference may be minimal. Political environments can, however, change in a single election, and a change to the status of administrative deference could nevertheless have lasting effects on how agencies regulate. A change in the status of administrative deference may not occur, but if it does, it could hurt the current federal government’s ability to repeal existing agency regulations. *Chris Erickson is a Junior Editor on MJEAL. He can be reached at cerick@umich.edu. 5 U.S.C. § 706(2) (2012). Michael Macagnone, House Passes Bill Ending Chevron Deference (Jan. 11, 2017, 8:55 PM), https://www.law360.com/articles/879235/house-passes-bill-ending-chevron-deference. Regulatory Accountability Act of 2017, H.R. 5, 115th Cong., § 202 (1)(B) (2017). Coincidentally, Gorsuch’s mother, Anne M. Gorsuch was the defendant (as the head of the EPA) in the original lawsuit brought by the National Resources Defense Council. Chevron challenged the ruling as an affected party, which resulted in the decision that established Chevron Deference. Matt Levine, Chickens and Slot Machines (Feb. 7, 2017, 11:34 AM), https://www.bloomberg.com/view/articles/2017-02-07/chickens-and-slot-machines; Noah Feldman, Get Ready, Supreme Court Fans. Brush Up on Your Chevron Doctrine (Feb. 3, 2017, 12:21 PM), https://www.bloomberg.com/view/articles/2017-02-03/get-ready-supreme-court-fans-brush-up-on-your-chevron-doctrine. See Cass R. Sunstein, Beyond Marbury: The Executive’s Power To Say What the Law Is, 115 Yale L.J. 2580, 2588. Sunstein, supra note 17, at 2599. A “point estimate” indicates a single permissible statutory interpretation. A “policy space” indicates a range of possible permissible statutory interpretations. Court’s Limited Resources for Judicial Review of Agency Action, 87 Colum. L. Rev. 1093, 1107–08 (1987). Juan Carlos Rodriguez, GOP Push To ‘Repeal’ Chevron Deference May Come Up Short (Jan. 5, 2017, 8:11 PM), https://www.law360.com/articles/877708/gop-push-to-repeal-chevron-deference-may-come-up-short. Peter Schroeder, GOP Unveils Dodd-Frank Alternative, (June 7, 2016), http://thehill.com/policy/finance/282371-gop-unveils-dodd-frank-alternative; Matt Gaetz, a Republican Congressman from Florida, sponsored the bill to terminate the Environmental Protection Agency. H.R. 861, 115th Cong. Next State Schemes to Encourage Renewable Energy: A New Friend on the High Court?